To say I am pleased with my Henry Big Boy rifle chambered in .357 Magnum/.38 Special would be the understatement of a lifetime. 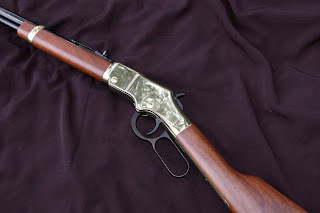 The Henry Rifles are gorgeous rifles which shoot exceptionally well however since that first shot of the larger caliber-ed Henry Big Rifle, my lust has also been to also own the .22LR equivalent...the Henry Golden Boy. My wife is familiar with impatiently dropped not-so-subtle hints around every special occasion and always for just one thing... a .22LR Henry Golden Boy rifle. 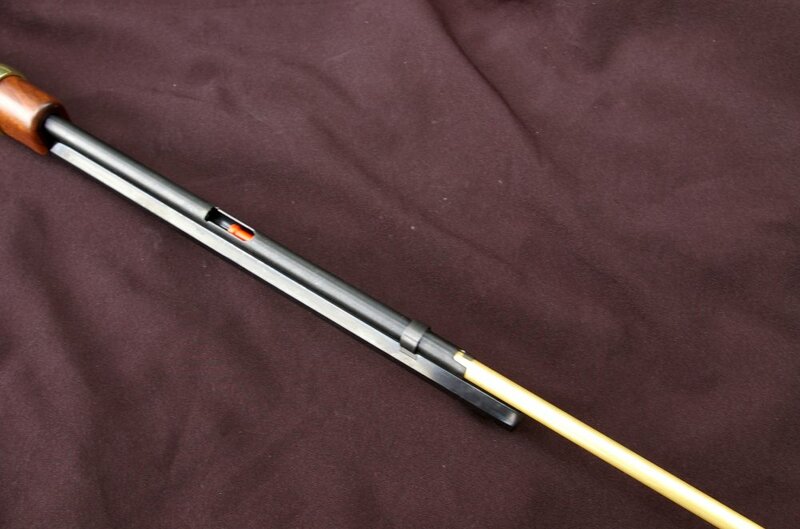 At last the day has arrived and I now own the finest quality, shooting and handling .22LR rifle made. Spoiler alert, I love it. I have observed that there are only three types of people; those that have never shot a Henry Rifle, those that have and lust after one, and finally those like me that own one or several. That I know of, no one has ever shot a Henry Rifle without developing a lust for them. A friend calls it the crack of the gun industry and salivates all over my Henry Rifles ever time we get together to shoot. The Henry Golden Boy is definitely a 22LR rifle everyone will fall in love with. The thought of a lever action rarely crosses many people's minds when shopping for a new rifle until they put one in their hands. 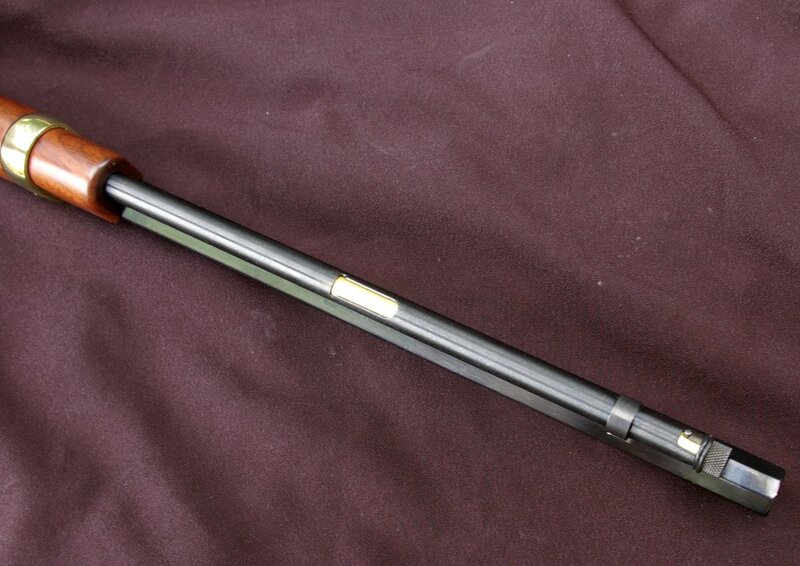 The Henry Rifles draw you in, the fit feel and finish begin your mind’s journey back in time to the old West, and by the time you pull the trigger and rack in the next round as you watch your tin can dance, the hook is set so deep that a love affair of Henry rifles is inevitable. Someone once told me more Henry rifles are sold at the range than in gun stores... stores were just places you purchased them. 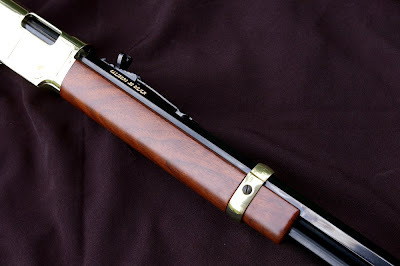 Everyone falls in love with Henry rifles not only because of their history and quality, but also because they shoot and cycle exceptionally well. Most people will say the same thing when they pick up a Henry, “they knew something about firearms and shooting back then.” The rifle is relatively light, extremely well balanced, points easily, and of course is an excellent shooting rifle. 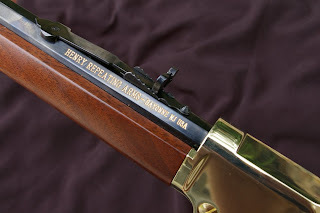 Henry knew they needed to keep the Golden Boy competitively priced to other .22 rifles. The .22 rimfire driven Henry Golden Boy rifles carry the same high quality features as their Big Boy brothers but in a slightly smaller package and with only one compromise that keeps the gun fiscally attainable. 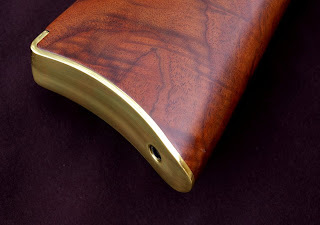 The Golden Boy rifles feature the same historic semi-buckhorn style rear sight, brass bead front sight, stunningly beautiful blued octagonal barrel, brass buttplate, brass barrel band, steel parts, and perfectly finished American walnut stock. It should be noted that the $800 street priced Big Boy does have a one notable extra. The big brother has a solid brass receiver, the Golden Boy a Brasslite receiver. The Brasslite receiver keeps the weight down and the Henry Golden Boy affordable with no discernible downgrade. The Henry Golden Boy tube magazine holds a massive 16 rounds of you favorite .22LR ammo or up to 21 of the spooky quite 22 Short/CB rounds. That is a huge ammo capacity by any standard which makes the Henry Golden Boy a blast to shoot up box after box of inexpensive 22LR ammunition. For the hunter, the capacity negates any need for field reloading. The reload does takes a bit longer than a magazine change but is simple enough and requires the magazine spring tube pulled partially out and rounds slipped into the tube. One company makes a speed loader which I hope to review in a future article. The next point I feel I must make is how fast the Henry Lever actions shoots. Shoot the Henry Golden Boy next to a semi-auto 22 and you will be surprised how well you keep up the pace and then of course you also have 6 extra shots with 22LR while the other guy is reloading. The action is safe and simple to operate, shoots faster than a bolt action and slows the beginners (and old) shooters down enough that shots connect more consistently connect due to better sighting. Lever actions are also far less dirty than their semi-auto cousins because gas is not being blown back during the cycling process. Due to the cleaner cycling, lever actions are also more reliable as the shooting action goes on and round counts and fowling goes up. From a safety perspective, the simplicity of the transfer bar safety prevents accidental firing when decocking/lowering the hammer. The Henry Rifles have what I term as a "single-action revolver safety" which negates the need for additional thumb or finger safeties. 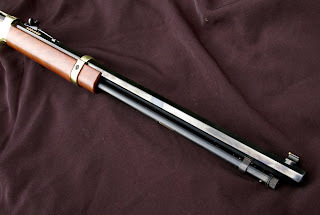 For a hunting perspective, having the ability to safely have a live round in the chamber and only requiring the hammer to be cocked prior to a shot makes this a very safe rifle to carry for hunting... all with fewer safeties. As the rifle’s lever is racked, a new round is automatically chambered and the hammer is cocked... it all could not be simpler. 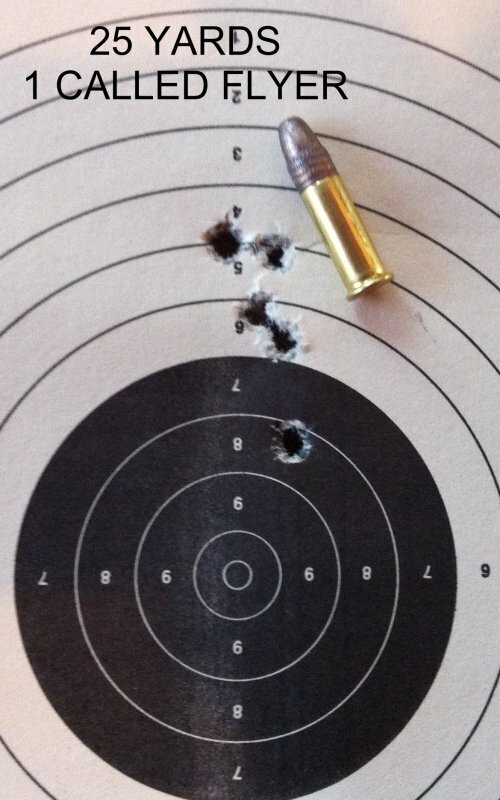 Recently a fellow shooter was tinging the 12" 200yd gong consistently and I joined in and was stunned how easy a task this was even with open sights. 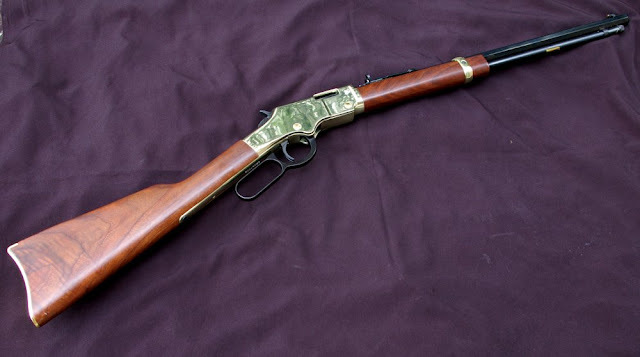 The Henry Golden Boy rifle is an easy gun to shoot accurately. As shown on my below iron sighted .75” - 25 yard group (with one called flyer) is impressive, but add in the fact that is was shot with the cheap Winchester bulk pack 333 ammunition and it’s a mightily outstanding group. I will at some point add a few extra groups, however once you start shooting and see how well the Henry Golden Boy shoots, you start to forget about shooting bulls-eye targets and start hammering spinners and cans and start looking for squirrels. The front brass bead front sight works great. The Semi-buckhorn is also highly functional, but just not favorite. In a future article I will walk you through adding a historically fitting Skinner peep sight to a Henry Golden Boy. 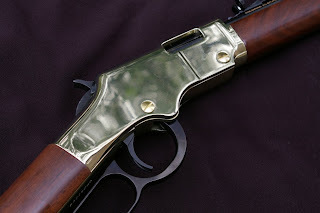 Own a Henry Golden Boy rifle and you will proudly claim it as your favorite .22. This is the "Standard" Henry Golden Boy and their limited engraved versions are even more gorgeous. Once my buddy who had fallen in love with my Henry Big Boy 357 and found out I had picked up a Henry Golden Boy as well, he invited me over to a family plinking shoot off with his two daughters. Everyone loved the Henry and even his elderly mother pulled the trigger on a couple shots. This is one heck of a family oriented rifle that everyone loves and it is that universal appeal that is special about the Henry Golden Boy. From 8-80 year olds, both male and female all get excited over shooting it fast, slow, and everything in between and it truly is a family rifle that everyone enjoys pulling out and shooting. The Henry Golden Boy Rifle is also the perfect fit as a gun to begin the younger crowd transitioning from air-rifles to real .22 rifles. The Henry Golden Boy is a phenomenal gun to shoot, handle and own whether you wear a Stetson or a baseball cap this is the perfect .22 rifle. Now of course I need a Henry 30-30 and Mare’s leg as well.